Look for the star on the front of the featured producer’s booth each week! Both Farmers’ Markets take their seasonal break from December - mid January. The UCSF Farmers’ Market is brought to you by Campus Life Services Retail and Pacific Coast Farmers’ Market Association. For more information, visit them online and on Facebook. 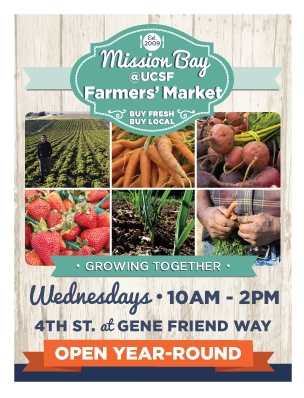 * The UCSF Farmers’ Market at Mission Bay is a green event in support of the UC San Francisco Zero Waste by 2020 initiative. Compost and recycling bins are provided and managed by UCSF Campus Recycling Program for your convenience.